Leopard Catamarans Brokerage is Proud to Present the Exceptional 2017 Leopard 40 Owners Version "Indian Summer" in Boat Show condition, Upgraded and Ready to Sail Away anywhere !! 2017 ROBERTSON AND CAINE LEOPARD 40 – "Indian Summer"
BROKERS REMARKS: Indian Summer is a desirable Owners Version with 3 Cabins and 2 Heads, perfect for a couple or a cruising family. Yanmar engines (est1100hrs), Raymarine Electronics Package with 24 nm Radar, Northern Lights 6kw Generator (600hrs), Fresh Water Electric Flush Heads, Air Conditioning, Electric Dinghy Davits, Dinghy and 20hp Honda Outboard, Custom Cockpit Cushions, Spectra Watermaker, and blue underwater lights... Indian Summer is ready now to be sailed anywhere, and very well maintained by experienced sailors. Contact Leopard Catamarans Brokerage now, she won't last long on the market! 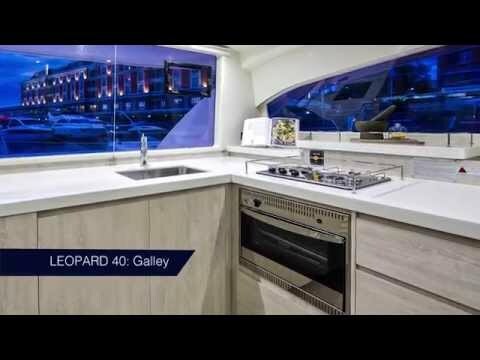 BUILDERS REMARKS: The Leopard 40, a product of South African boat builders Robertson & Caine, features a unique, modern design thanks to experienced naval architects Simonis and Voogd as well as Robertson & Caine's design team. She resembles her predecessors in speed, agility, and blue-water performance, but her enhancements include an increased hull volume and an innovative interior layout, which is unlike any Leopard before her. Her galley is located forward and the forward-facing settee and window and an access door to the forward platform of the boat. This allows for a panoramic view with large sliding glass doors between the saloon and the aft cockpit. This arrangement promotes easy communication for guests and an open flow between the saloon and the aft cockpit, creating a fusion of indoor and outdoor living space.